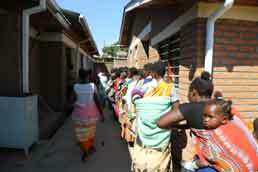 It’s a sunny July Wednesday, July 30, and the Ndirande Health Center in the outskirts of Blantyre, Malawi is buzzing. At the health center, some 10,500 patients with HIV routinely receive antiretroviral therapy (ART). Among them are 6,000 mothers and their children. Photo: © WHO/ZakwathuCommunications Click to see larger photo.